There was much classical biophysical evidence that ion channels have an aqueous pore , and the arguments all hinged on measuring fluxes in the channel. The first argument was a technical one. Measurements of forward and backward isotopic K+ fluxes in K+ channels showed that K+ ions move in a coordinated fashion, as if the pore contains a column of several K+ ions moving in single file in a pore . Similarly, water movement in water channels (aquaporins) has the properties of a continuous column of water molecules moving in correlated fashion . A more intuitive argument for a pore in ion channels is the high throughput rate, which easily reaches values of 106 to 108 ions per second. This means that all the steps of recognizing and passing each ion across the membrane take place in only 10 to 1000 ns, a time much shorter than any known enzymatic catalysis but perfectly compatible with diffusion in an aqueous pore of atomic dimensions. Another major argument for a pore was the finding that many small channel blockers act like plugs entering a tunnel that becomes too narrow for them to pass all the way through (Fig. 1). Strikingly, the plug could be knocked out of the pore (thus unblocking the channel) by raising the concentration of permeant ions on the opposite side of the membrane. The classic example was the block of K+ channels by intracellular tetraethylammonium ion (TEA) and analogs, which could be relieved by raising the extracellular K+ concentration . Armstrong  argued that the only way for external ions to push out an internal blocker was if they met each other within a pore. Finally, the ion selectivity of several channels (e.g., voltage-gated Na+ channels, nicotinic acetylcholine receptors, and y-aminobutyric acid [GABA] receptor channels) could be explained by assuming a rigid pore size that passes ions smaller than the postulated hole but not those larger than the hole [1,5]. Modern confirmation of these older ideas comes from X-ray crystallography. As had been predicted from the functional studies, the crystal structure of the bacterial KcsA K+ channel shows beautifully a long pore of atomic dimensions with 2 to 4 K+ ions residing within the narrow tube (; also see Chapter 34). 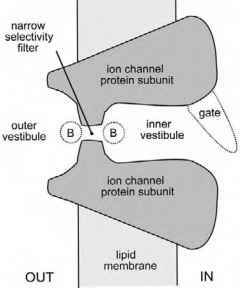 All ion channels related to K+ channels should have a similar structure. This would include voltage-gated Na+, K+, Ca2+, and Ih channels; inward rectifier K+ channels; and two-P domain K+ channels, as well as cyclic-nucleotide-gated channels and ionotropic glutamate receptor channels. They all belong to the structural superfamily of ion channels formed by four homologous subunits or by four homologous domains with four P loops (reentrant pore loops) coming together to line the narrowest part of the pore (see Chapter 34). 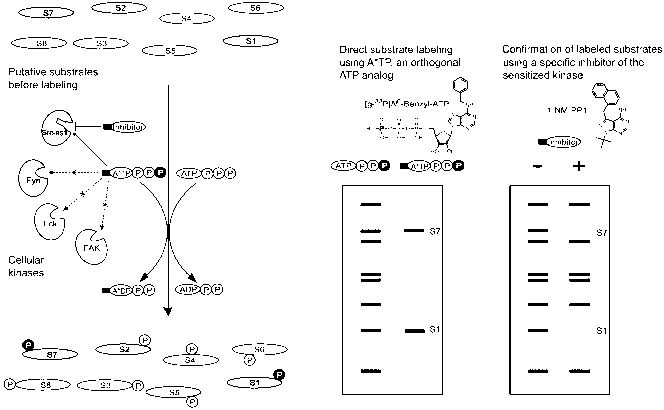 Figure 1 A highly selective ion channel of the voltage-gated family, showing the functional parts discussed in the text. The circles labeled B represent the binding positions of blocking drugs that would act to plug the narrowest part of the pore from the inside or the outside.